Is Maribor cultural guide really necessary considering the size of the city? I am a little bit of an art enthusiast myself and although Maribor is only a small city there is plenty of historical buildings, small galleries and places where I can rest my eyes on wonders of ancient and modern authors from all walks of life. ...a day of magnificent art - a day for your soul and heart. PART 1 (9am - 11:30am): A super short walk to the northeast corner of the Castle square to the main entrance of the Castle and the Pokrajinski muzej Maribor (Regional Museum of Maribor). A short coffee break in Astoria, Caj-ek, Ilich, Kruh Pecivo or Park cafe afterwards is a perfect way to prepare for more. PART 2 (11:30am - 12:30pm): Walking a few hundred meters north from the castle towards the city park you reach Muzej Narodne Osvoboditve (National Liberation Museum). 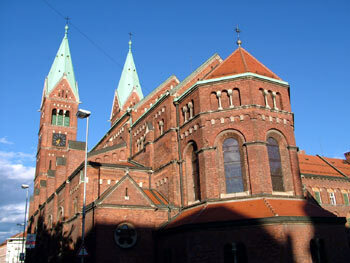 PART 3 (12:30pm - 1pm): Walking south from the museum, the next stop is then the beautiful Franciscan church. PART 4 (1pm - 2:45pm): Lunch is well deserved after a few hours of walking. We would definitely recommend Ancora, Gala Zar, Rozmarin, Stajerc and Toti Rotovz. 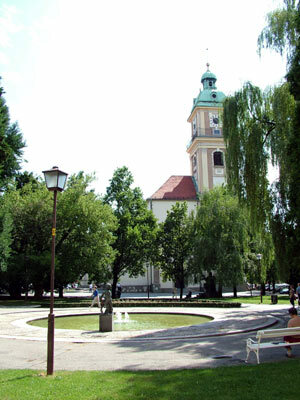 PART 5 (2:45pm - 3:45pm): Maribor cathedral: Slomsek square is among my favorite places in Maribor. The view from the cathedral tower is breathtaking let alone the historical value of the church. PART 6 (3:45pm - 6pm): Gallery crawl: From Gallery Premzl, Gallery Petrina, Maribor Art Gallery, Gallery Lent, Gallery Hest, Gallery Dlum to a world class multimedia center KIBLA and nostalgic Masters Hochstatter Photo Gallery. Surprising array of artistic marbles for true lovers of art. PART 7 (6pm - 7:30pm): Dinner time: Perfect timing for having a ncie dinner just before visiting a theater. As above we would definitely recommend Ancora, Gala Zar, Rozmarin, Stajerc and Toti Rotovz. PART 8 (7:30pm - onwards): The climax of the day is a theater performance in the Slovenian National Theater Maribor, one of Europe's top theaters. Wonderful repertoire in one of Maribor's architectural wonders. A drink in the Gledaliska Kavarna (Theater Cafe) beforehand or during a break is a standard. One of Maribor's most remarkable architectural masterpieces sits right in its centre: Maribor’s town castle is surrounded by the busy Grajski trg (Castle square), Trg svobode (Liberty square) and Trg Generala Maistra (General Maister square). 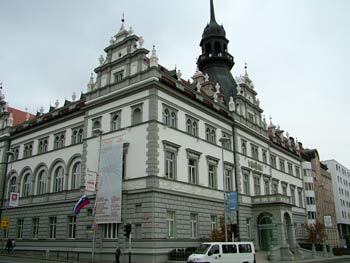 It is a home to the Regional Museum of Maribor, with a number of invaluable collections. The castle, which boasts several period styles, was built by Emperor Friderik III between 1478 and 1483. Its purpose was initially to fortify the north eastern part of the town wall. The castle was then gradually changed into a rich feudal residence. Festive Hall on the 1st floor with its wonderful ceiling, painted by Jozef Gebler and its murals. The eastern part of the castle is enriched with a bastion in the north-east corner. It is the work of the builder Domenic dell’Allio from 1556 to 1562 representing a major defense point. The whole castle is undergoing a massive restoration that is to be completed by 2012 so only a small proportion is actually open to public! Kavarna Astoria (Coffee-house Astoria) with its "EZLEK" (ask the locals about that) was a very popural meeting place for many Mariborians in the past and it is a very popular meeting place for many Mariborians also today. Before the Second World War Kavarna was owned by the Petan family but it was originally a horse stable as an outbuilding of the City Castle. Today it is a coffee-house, restaurant (La Storia Trattoria), confectionery and pizzeria all in one. What really matters for me is that this place is actually one of the rare places where you can sit outside and bath in the morning sun late in the autumn, spring and even during the winter when other places can just dream about chairs and tables outside. In 1989 Kavarna Astoria witnessed filming of a movie about its owner's family in the Second World War. When I was writing this part about Kavarna Astoria my husband told me that he was taking part in the movie as an extra. Big surprise for me, really. He was a school boy at the time wanting to earn some money for summer holidays. But it is an absolute disgrace that he has actually never seen the movie! Well, this is actually a tea room, in fact this is Maribor's first tea house. I have, with pleasure because they are so damn good, witnessed their development from a small cinema tea house to a shopping mall tea house to finally re-brand themselves into a cute city center tea house. It is one of the most beautiful tea houses I've ever seen. However, they of course don't serve just tea. They will serve you, yet again, wonderful coffee and I really like their home made House cake. Slovenska street is obviously blessed with good cafes and Ilich is one of them. What makes them special is their long confectionary tradition. They produce marvelous desserts but their ice creams are really extraordinarily delicious! Coffee, as expected, is excellent so time here will be well spent. The cafe is a very popular meeting point for Mariborians who enjoy great coffee and absolutely delicious freshly baked cakes from the bakery (ask for delicious KREMSNITA, pronounced creme-snee-tah). If you want to eat really fresh bread pop in in the morning and choose between different sorts of bread baked just a few hours ago. I really like to visit the bakery especially when the weather is warm enough to sit outside and observe the buzz around me. This is a recent addition to Maribor's rich and excellent coffee culture. A new building just next to the Tourist Information Center brought a new cafe and they are good, no doubt about that. I still have to explore their offer in more detail but so far it promises to be yet another excellent coffee house in Maribor. 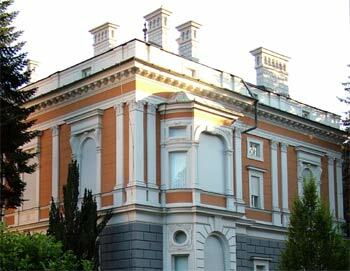 The museum's home is a villa that was built in the late 19th century by a Scherbaum family. In the First World War the villa was a home to Austro-Hungarian Soca front Supreme Command. The building was then used for various purposes until 1954 when the museum has finally been established. The Museum of Slovenian Modern History is partly dedicated to the national liberation from the 2nd World war Nazi occupation but they also regularly host a number of exhibitions (e.g. puppets, photography, etc.). National Liberation Museum from the city park. The current church with a monastery was built between 1892 and 1900 and replaced an older Capuchin church from 17th century but the vault itself has been preserved.The church has been ordered by the Franciscan monk Kalist Heric, deisgned by Viennese architect Richard Jordan and built by a Viennese builder Josef Schmalzhofer. It's major architectural symbol are the two 58m tall bell towers. the main entrance is behind the two towers. 7 November 1906 is a remarkable date for the church as it has been pronounced for Basilica Minor by the Pope Pius X - the first of its kind in the then Austro-Hungarian Empire. The church interior is decorated with various magnificent details of which the main altar made of 17 different types of marble is the most prominent. In addition there are also 6 side altars. It's a hidden gem of the city center as it doesn't look much from the outside but wait and see inside! Pizza in Ancora is one of the best in Maribor but the rest is equally good. We had fabulous lasagnas here, both vegetarian and meat. Bartenders know their way around food and wine really well, and as a result we are their regular guests. Absolutely fantastic new chic Maribor restaurant. We were really impressed by the quality of food, creativity, wittiness and refinement of their bartenders. In addition their award winning interior, a coffee bar and a wine cellar will make your lunch/dinner here truly wonderful. My personal opinion is that this is the best restaurant in Maribor's city center. Traditional Maribor and Stajerska cuisine, wonderful beer from their mini brewery, pretzels and huge terrace overlooking the busiest part of the pedestrian zone are the marbles of this restaurant. It's difficult to miss the place as it has such a central and wonderful location but their food is good and we are regular customers. This is a wonderful restaurant with Slovenian, Serbian, Mexican, Thai, Japanese, Greek and Italian cuisine so they certainly can satisfy a variety of tastes. We were lunching and dinning in this restaurant and the experience was always good. Dinner in their wine cellar is particularly attractive due to the ambient and live music during weekends. Forget about fast food and burgers! Gala is our favorite Balkan restaurant where burgers have a completely new dimension. Stuffed pleskavica is awesome, Sobska salad unforgettable and all the rest is simply delicious. The history of the Maribor Cathedral starts in the second half of the twelfth century with the first notice of a parish priest Konrad who had his seat in a church built by the Styrian count Otokar III. The church was originally a single aisle Roman building with a wooden ceiling and semicircular apsis, which grew bigger with the growth of the town, and was dedicated to John the Baptist. In the middle of the fourteenth century two side aisles were added to the main aisle on the north and south side, and from 1380 to 1390 a Gothic stile presbytery was also added. The famous images of four Evangelists on the presbitery ceiling and on the Gothic sedilia are from that period, too. At the beginning of the sixteenth century the wooden ceiling of the main and side aisle was replaced by a Gothic arch, which is indicated by the inscription from 1520 on the north wall of the main aisle. During the baroque period both chapels were added, the chapel of St. Francis Xavier with rich ceiling decorations in 1716 and chapel of the Holy Cross between 1775 and 1776 with the fresco "Finding of the Holy Cross" painted by Vienna's Painter Adam Molk. The altar of the Holly Cross was made by Maribor's artist Jozef Holzinger. The famous chairpaws are from the same period as well as the Holzinger's relief that shows the life of John the Baptist. The reproduction of Ruben's "Election of the Cross" is also interesting (the original is in the Antwerp Cathedral). The pipe organ was made by the German organ-builder "Walcker", and has 3 manuals and 37 stops. west of the Slomsek Square. The church-tower originally 76 meters high, but since it was struck by lightning in 1792 only 57 meters high, has four bells: C-2300 kg, Es-1600 kg, F-900 kg and As-530 kg. The parish church of John the Baptist has been turned into the Cathedral on September 4th 1859 when the Bishop Anton Martin Slomsek, moved his seat from St. Andrä in Carinthia to Maribor. In the same year on October 14th, he founded the college for theological studies, which was the first college in Maribor. He also established the brotherhood of St. Cyril and Metodius to promote the unity among Christians. Holy mass: Sunday and holidays: 7 am, 8 am, 9 am, 10 am, 11 am, 6 pm; April 6.30 pm, May-August 7 pm. Working days: 6.30 am, 7 am, 7.30 am, 8 am and 6 pm; April 6.30 pm, May-August 7 pm. 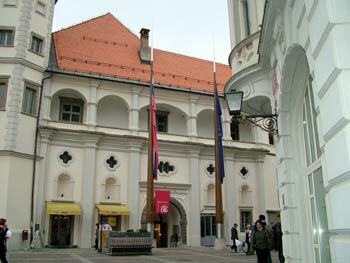 They organize four exhibitions per year and normally sell modern and some older works of Slovenian and other authors. The offer includes old cartography and veduta graphics from the region of Slovenia from the 16th to the 19th century. The gallery is owned by the author and also bears her name. This is one of Maribor's nice little family run galleries with a colorful selection of a wide variety of works. 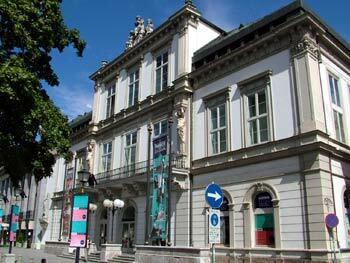 Maribor Art Gallery is the largest and most important gallery in this part of Slovenia. Their permanent exhibition is a wonderful collection of masterpieces of some of Slovenia's most important artists. However, they regularly host visiting exhibitions, lectures, workshops for kids and adults. I've been to several exceptionally well organized openings and my experience of the place was always positive. The gallery is located in Maribor's old town where a gallery of this type is a must. It is owned by Vlado Petek, the author of most of the art work on sale. He is particularly obsessed with metals so the gallery is full of various graphics and abstract forms but you can really find a wide selection of art work. Gallery Hest is one of Slovenia's leading galleries. They regularly organize very popular exhibitions and offer wonderful works of some of the best Slovenian painters. This is yet another hidden gem in the Maribor's cultural life. Although pretty modern inside the gallery itself is located in the medieval Jewish Quarter with a special character. They exhibit works of the Maribor's Fine Arts Society. Yet another magnificent cultural institution in Maribor. The center is the first institution of its kind in Slovenia and is truly remarkable. Famous Australian artist Stelarc has said for MMC KIBLA "this is the best cyber space in Europe" the great Eduardo Kac, who works at the Art Institute of Chicago, "something like this doesn't exist in United States" and Joseph Tabby, university professor and writer, "I came to visit Slovenia, because I've heard about KIBLA.". Specialised humanistic library, cyber bar, multimedia lab, publications office and IT market space are just some of their numerous activities. They organize festivals, international projects and competitions, and are definitely the most active multimedia center I've ever visited! Narodni dom is a cultural and event center. With over 1000 events every year it is one of the biggest cultural institutions in Slovenia and Central Europe. They organise music, theater performances, festivals and other cultural events. Each year for the past XY years and counting they organise an infamous International Lent festival attracting around 600.000 visitors. But that's not all, they also organise the International Folklore Festival - FOLKART and the International Chamber Music Festival Maribor. How can I possibly describe this photo gallery and its owner? No words can describe this wonderful 19th century experience that you can nowadays only see in movies. Medieval building, Master Hochstatter with his long white hair and a set of world class classical cameras he is using produce results beyond description. The best small photo gallery for true connoisseurs and lovers of art, no doubt about it. Slovenian National Theater Maribor (Slovensko Narodno Gledalisce Maribor) is the largest public cultural institution in Slovenia and one of only a few European theaters that unites Opera, Ballet, Drama and Symphonic Orchestra under one roof. The history of organized theater dates back to 1785 but the building as it is seen today was built in 1851. Maribor theater is truly spectacular. Every October they organize Slovenia's oldest theater festival Borstnikovo Srecanje (Borstnik Theater Festival). This is the most prestigious Slovenian theater festival that brings together the best performances from Slovenia and abroad and the final in a way resembles Oscar nominations although the winners in Maribor get a so called Borstnik's golden ring. Now, how cool is that! The 43. Borstnik Festival will be held in October 2008. Slovenians treat theater with great respect and you will see people dressed extremely smartly for the occasion. Plays and concerts in Maribor theater are excellent to say the least. This is actually mostly a result of excellent actors and world-class theater directors. Tomaz Pandur, one of world's best theater directors is one of them and his specialty is rich visual representation. His plays are theatrical fireworks and I always leave the theater with a commotion, they are so colorful and dynamic! The good old Theater Cafe is a cafe with a long history and great tradition. Well known by locals it is often visited by actors, actresses and other artists from the theater. They were always known for their excellent coffees and sweets. Sitting outside in the shade of great Slomsek square trees makes the experience even better.